When I was a boy, one of my favorite meals was what my mom called, "Clean out the Icebox." It might be soup, or a casserole, baked or fried, but I always liked it. My older siblings have somewhat different recollections. What's "Clean out the Icebox"? Just what it sounds like. Whatever leftovers mom found that could, reasonably (to her) be combined. Yesterday I made my own attempt. I had some leftover pot roast, as well as a little bit of the ragu I made weeks ago. (It had been frozen and thawed in the meantime.) 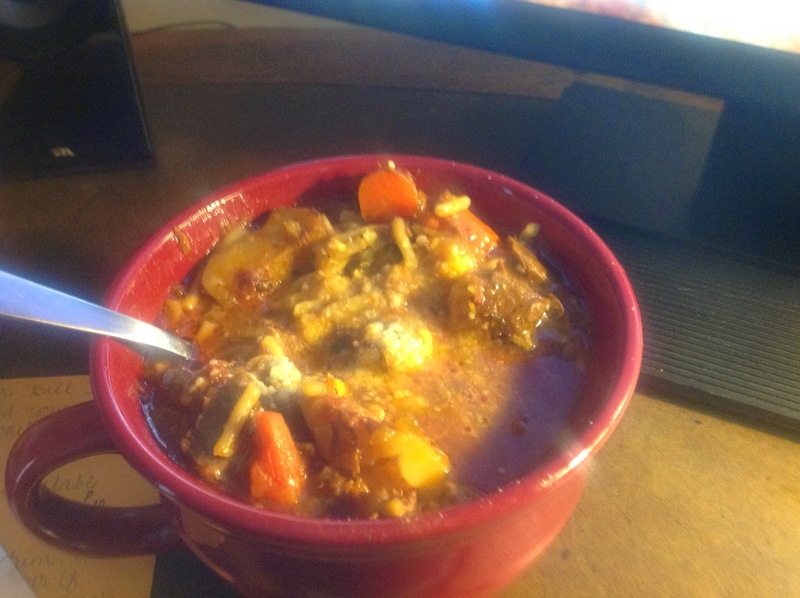 Plus I had some vegetables that were wilting, and some leftover beef broth. Yes, it does rather taste like what mom would have cooked! Oh, and FYI, this is an icebox. (There are pictures at the link.) We actually had one, growing up, but we also had an electric refrigerator, so mom used the icebox to store other things. My clever mom sawed off the bottom of it, so that it was just tall enough for the top to be a great work area. I think my brother has that now. Yep, I'm old enough to admit that one of my favorite TV shows was "The Honeymooners"; Ralph and Alice Kramden had an icebox like your Moms! Famous line: "One of these days, Alice, ..."
I like this sort of thing. I even tried it once in the pantry and had a sort of hummus based on hominy. Not as bad as you might think. I like to do this as well. It forces me to be creative in my cooking, and keeps food waste down. I always call them experimental meals. Cooking with leftovers is an adventure in creativity, and frugality, too. These are kind of lost virtures. Our local Goodwill has a sale this weekend for used prom dresses. I bought my prom dress at the Goodwill. Hopefully, when my daughter Manuela is prom aged, we will do the frugal thing, and the right thing, and go to the Goodwill for an amazing dress! If your sister told your grandmother that there was a little man in the ice box, that is kind of a German thing. Die Wichtelmaenner are little elves who do stuff like that. I told my oldest boy that if he didn't brush his teeth every night that the Wichtelmaenner would come and do it when he was asleep. That scared him straight. There are a lot of German fairy tales about these little people. Not just the shoemaker and the elves. German fairy tales are awesomely terrifying. Best ones. Question: if you are cleaning out the icebox on Friday would you eat meat? What do you think of a Catholic organization that has. Steak dinner on Fridays? Dear Jennifer, it was really hard in our family because we had German fairies & leprechauns trying to straighten us up & have us do right. I guess something or some worked as we all turned out pretty well :). I would eat the meat if that's what I had, and I didn't want it to go to waste. As far as Catholic organizations that serve meat on Fridays, that horse has left the barn. We need to recapture it. If you get my meaning. My father used to clean out the ice box periodically. Everything remotely edible was put through a meat grinder, smoothed out in a casserole dish, and heated in the oven. Pop called this "Army Hash". We ate it with ketchup, lots and lots of it.